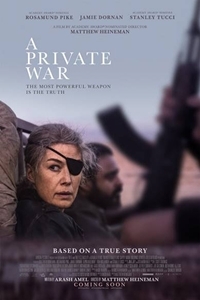 Marie Colvin (Rosamund Pike) is the most celebrated war correspondent of our era - a woman as comfortable downing martinis with high-society's elite as she is brazenly staring down warlords and fleeing from gunfire. Driven by an enduring desire to bear witness and give voice to the voiceless, Colvin charges into danger, constantly testing the limits between bravery and bravado. A pulse-pounding story told from the frontlines of the most dangerous battlefields in the world, A PRIVATE WAR chronicles Colvin's extraordinary life.